The theme for Day 5 of #Blogtober17 is education. I was stumped as I have no expertise in this field. I thought maybe I would write about my pet grammar hates; the misuse of there, their, they're, but I wasn't inspired. We were then forced to have two days close to home. 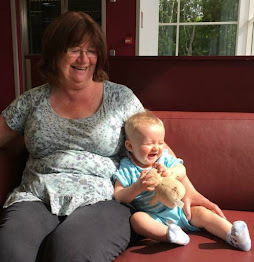 Bear had a tummy upset (euphemism for poo, poo and more poo) and going anywhere was out of the question, firstly incase of accidents and secondly, we didn't want to pass it on. Tuesday morning was sunny and dry so we decided to play in the garden. Something messy and fun, with paint and wellies. 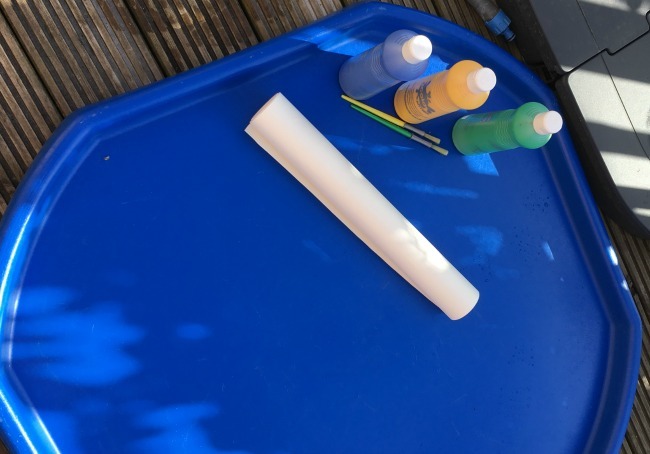 Welly Painting! Wednesday was cold so we did it indoors, in bare feet. Foot and hand painting and he loved it! 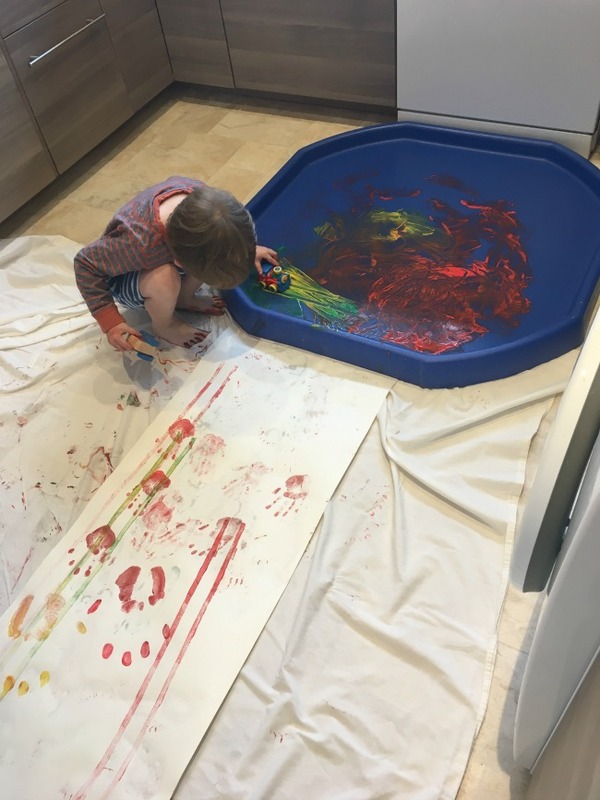 Bear learnt lots, I learnt that messy play with paint, a toddler and anything goes is very messy (but great fun). 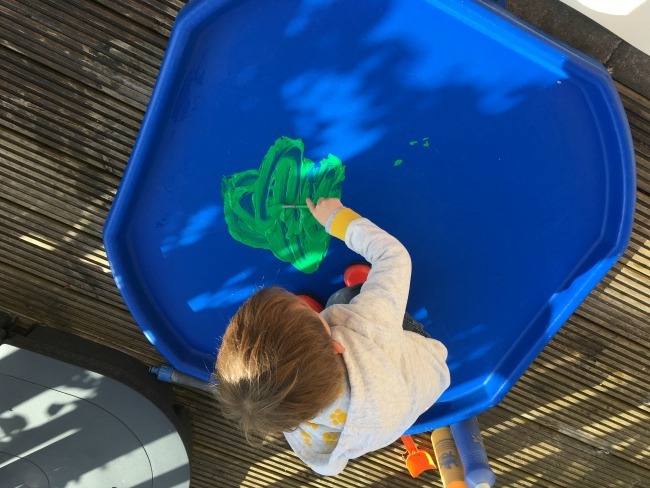 What Do Children Learn Through Messy Play? There's lots of research on the benefits of play, that children learn faster when they are encouraged in imaginative play. Play encourages innovation and language skills, it supports problem solving. 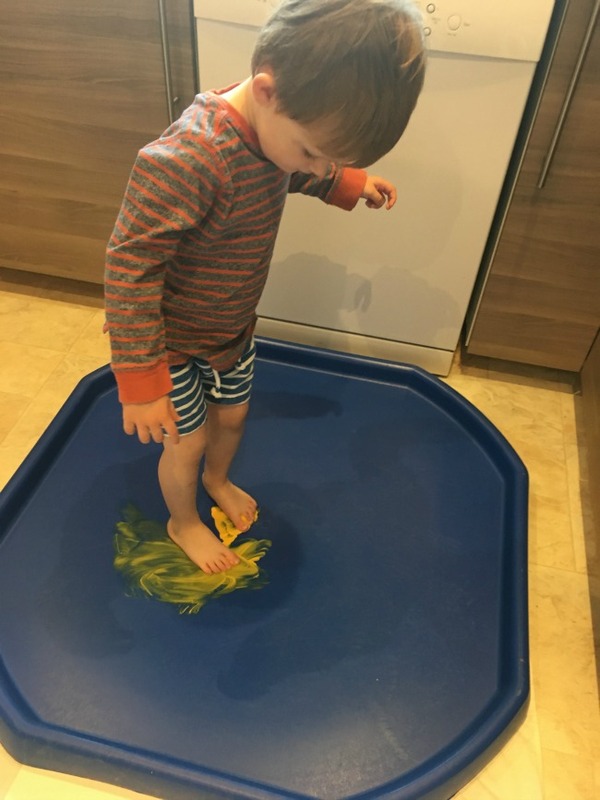 It helps develop fine and gross motor skills. 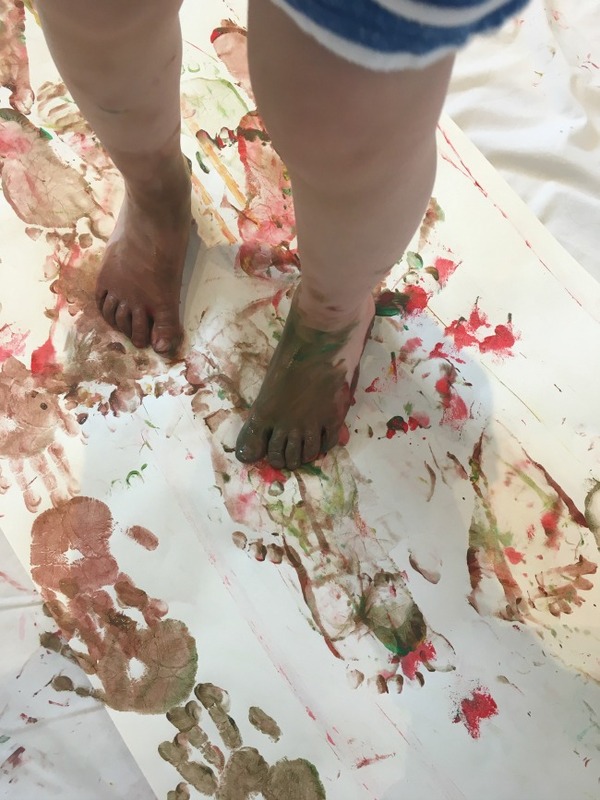 Messy play gives the child freedom to use their imagination and because there is no right or wrong way to play, it helps develop their self confidence and self esteem. It allows them to understand rules, and why they are needed. For this activity there was one rule. Stay on the paper, that was it. 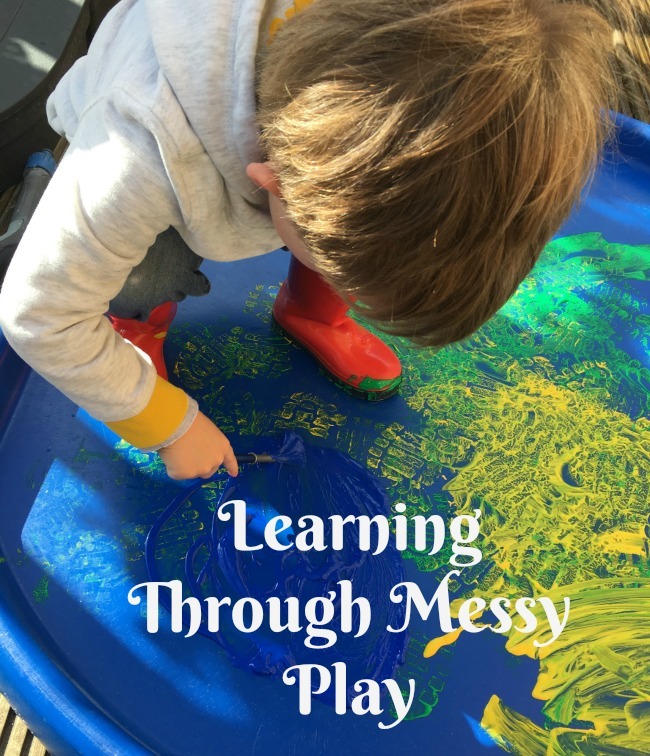 What Do Adults Learn Through Messy Play? 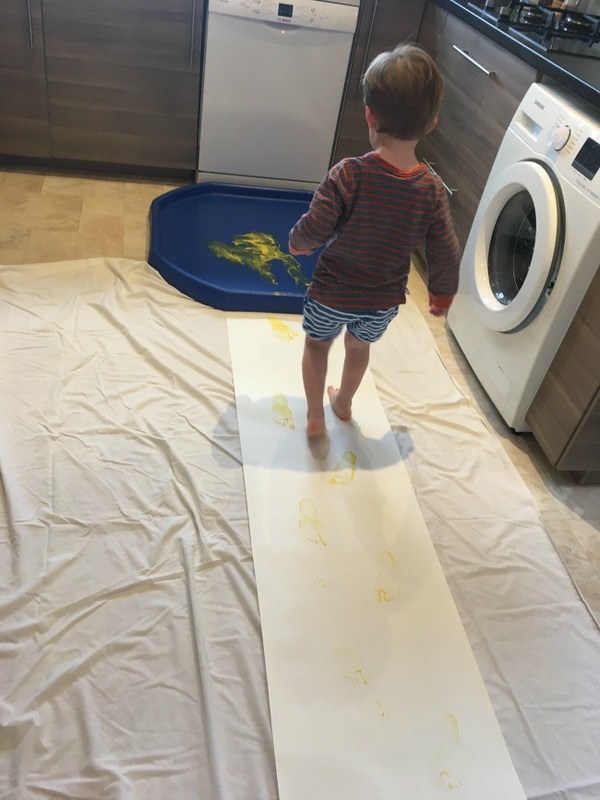 Messy play takes longer to clean up than it does to do, that a bath is necessary afterwards and that paint on a Tuff Spot is slippery. It was OK with wellies but much too slippery with bare feet. It is great fun and it's easier if there are two of you (One to clean up while the other does the bathing). You do not have to join in, if you do enjoy it too. If you do not like getting your hands dirty they will notice and it will affect their play. Don't interfere, be there to guide them but let their imagination do the rest. 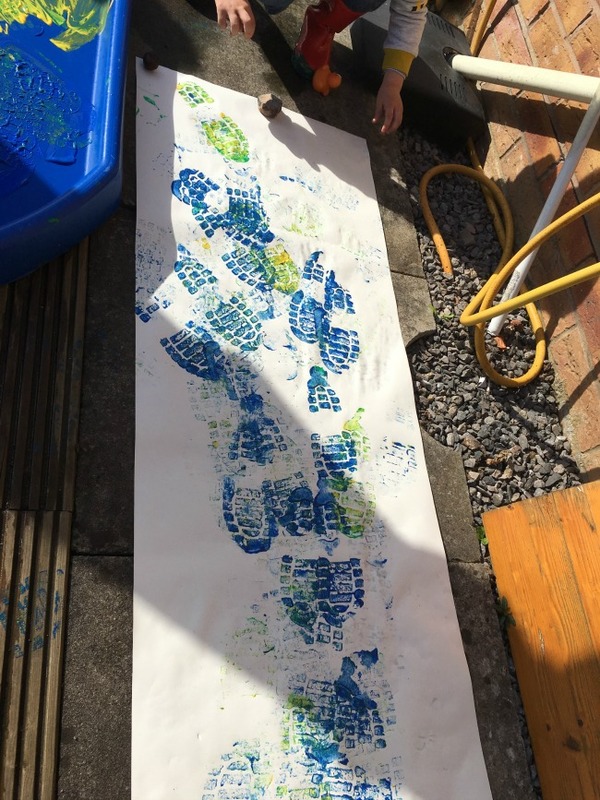 Ensure you use washable paints and old clothes, and if you are lucky you will be able to keep a muddy looking print as a memento. Other items to make prints, cars, potato stamps and so on. The roll of paper curled up and moved in the breeze. Bear chose the stones to weigh it down. He learnt that conkers were not heavy enough. When doing the painting the next day he ran and got the door stop to hold the paper, as soon as it was unrolled, without any prompting. 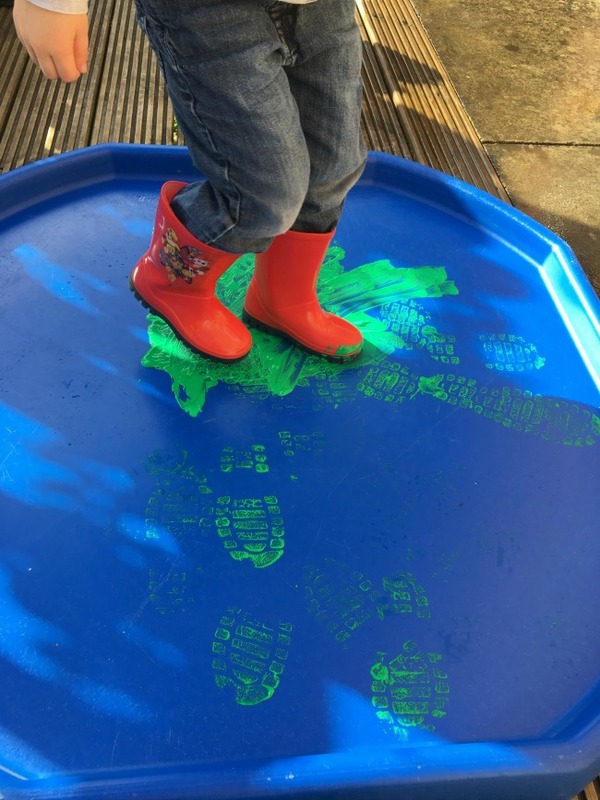 Squish the paint using your feet, be careful, this is now as slippery as an ice rink! and used a car to make tracks. I cut a potato in half and carved a star and he had fun stamping with it too. We both learnt that it doesn't matter what colour paint is used, it will always end up brown. We had so much fun but it really did make a lot of mess. 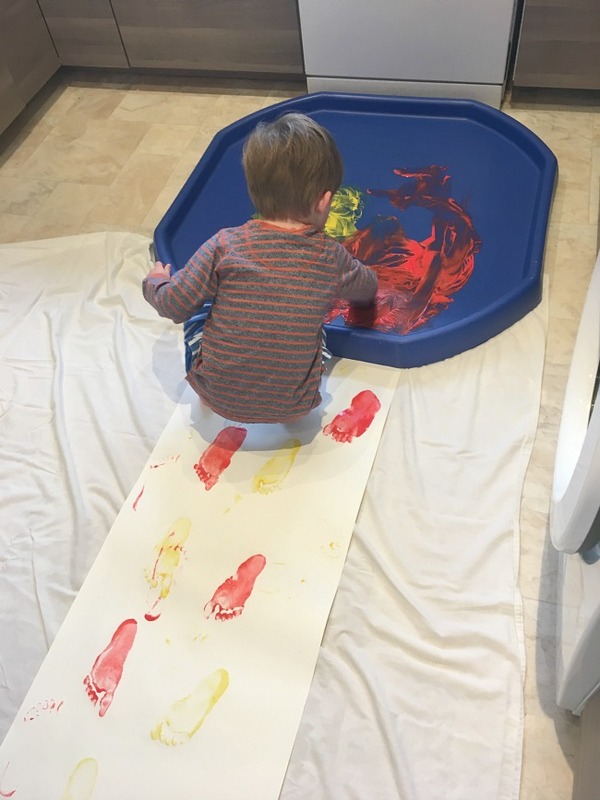 The boots outside was a great way to enjoy painting but I think Bear loved the bare footed one, he loved the feel of the paint on his feet and it washed off easily in the bath.